10. Strong hands & wrists. 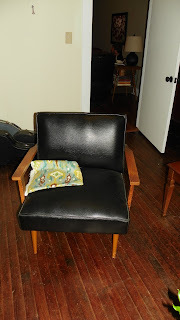 I wanted the music room in our house to have a little lounge area where my husband would have a place to sit and play guitars either by himself or with a friend. I was able to score these two mid-century modern style chairs for free from our church when they upgraded the office furniture in the pastor's study. I thought these would be perfect because: a) Daniel loved these chairs and always commented on how comfortable they were; and b) They sit nice and low to the ground and have no arms (well one of them had no arms...the one that did were really easy to remove) so they're perfect for sitting and playing an instrument across your lap with no arm-rests getting in the way. Obviously they needed to be recovered. I didn't take as many pictures of the process as I should have (I always manage to forget that step) but I'll try to explain the process as best I can. 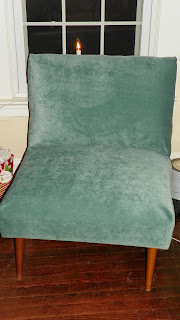 I read on the internet some basic reupholstery tutorials to try and figure out how to start. This was my first ever experience reupholstering anything, so this was definitely trial and error for me. The first step is to disassemble the piece you are working with. I started by unscrewing the legs and arm-rests from the chairs. 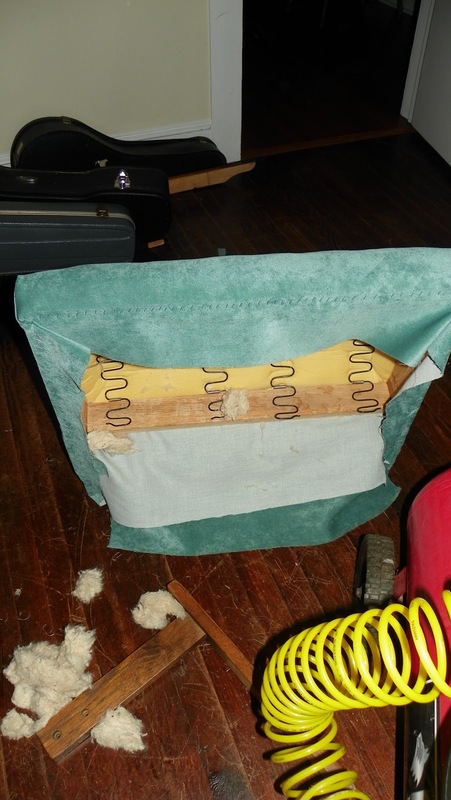 Then I removed the back panel of the chair which was held on by tack strips. I pried the tacks loose with a screwdriver and my husband's pocket knife (which I ruined...I would not advise using a pocket knife to remove staples... they make tools for that, but I'm impatient, so I went with what I had on hand... he wasn't very happy with me). Once the back panel is removed, it's a lot easier to see what you're working with and how the chair is put together. Then, get to work removing about a million staples. Once you have all the existing upholstery removed from your piece, save the pieces and use those to make the pattern for your new fabric. 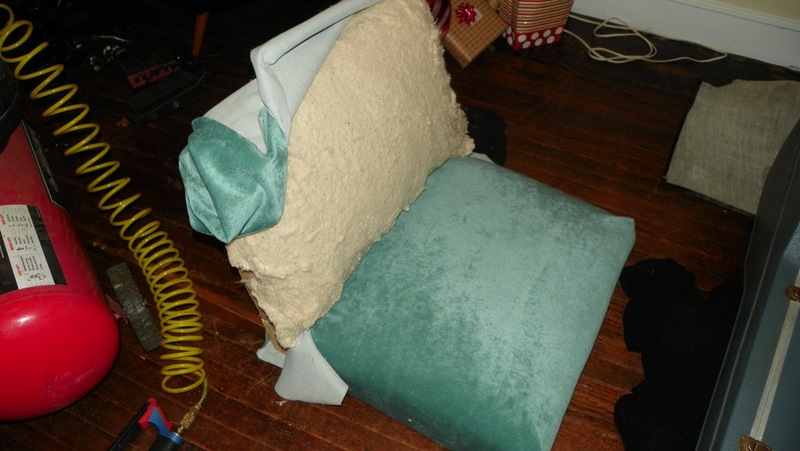 It took around 7 yards of fabric to recover both chairs. I am a terrible seamstress, and I knew I didn't want to tackle cording like the chair had originally, so I just stuck to the two simple seams on the corners of the back rest and seat. To do that, once I had cut my fabric patterns, I took my newly cut fabric and placed it over the chair upside down, pinched and then pinned the corners together, then just sewed a straight line over my pins to give the fabric the 'box' shape for the seat and back rest. 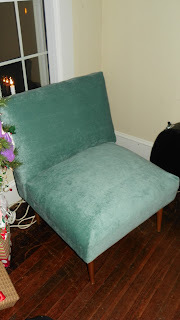 Once they were sewn, I placed the new fabric over the chair to make sure the corners were in the right places and confirm that it had a nice, snug fit. Once you have your pieces cut and sewn, you basically just fit the fabric over your chair, and then pull it tightly around and start stapling... and stapling, and stapling... To get the part where the back of the seat and the bottom of the back rest meet, you simply tuck/pull the excess fabric through to the back and staple, which you can kinda see in the pictures below. The sides are a little simpler since all you have to do is pull them taut and staple on the back of the wooden frame. You want your fabric snug but not too tight. 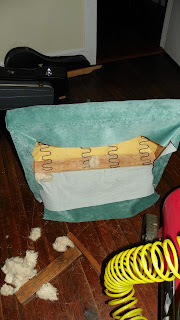 If it's too tight it can pull and tear the fabric where it's attached with the staples. 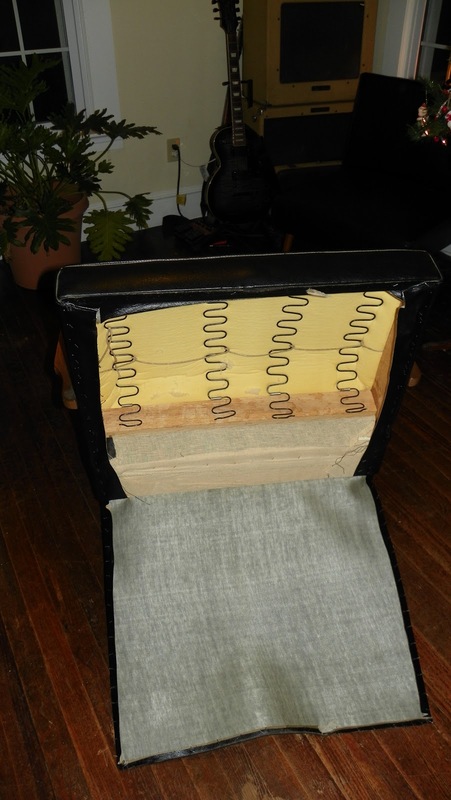 For the back panel, I salvaged the tack strips that were on the chair originally. For these you have to poke holes in the fabric. I started by laying the tack strip on the edge of my back panel and then fold it over, pushing the tacks through the fabric. Your fabric should envelop the strip so you don't have any frayed edges or strip showing. With the folded edge to the outside, I made sure the top of the tack strip was at the very top to get a nice crisp corner. Then I just put it up to the back of my chair and used my hammer to gently tap in all the tacks, working top to bottom. 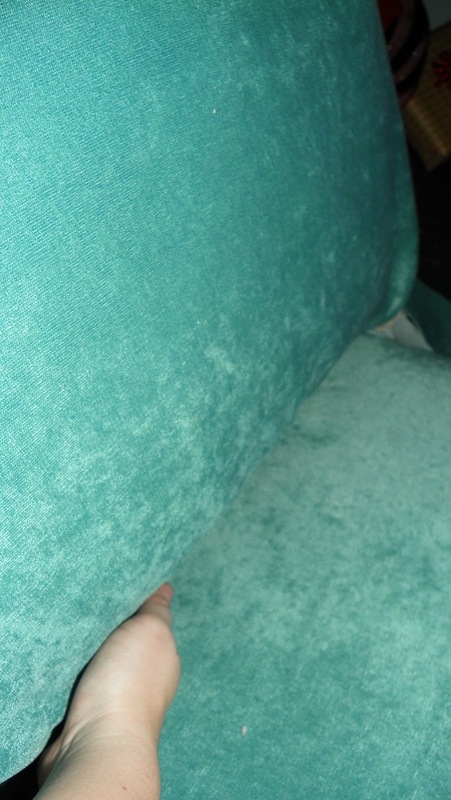 This gives your back panel a nice seamless edge all the way around and hides all the messy stuff underneath. Then, I simply screwed the legs of the chair back on. It worked, people. Amazing. Don't get me wrong, this project definitely tried my patience and made my hands really sore. If I had a lot of money in a piece of furniture, I probably wouldn't tackle this on my own. All that said, they turned out pretty-not-bad... they're only a little wonky in a few places, but not too shabby for my first attempt. I can't wait to get some coordinating cushions on these babies and get this room pulled together. Check back later for some glamour shots once it's all finished! It came out pretty, and I love the color and texture! I love your mid-century modern finds! 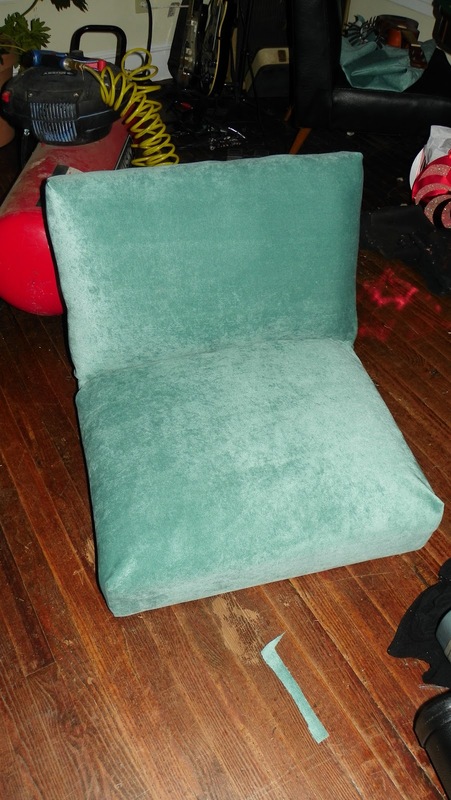 Great job on the reupholster! 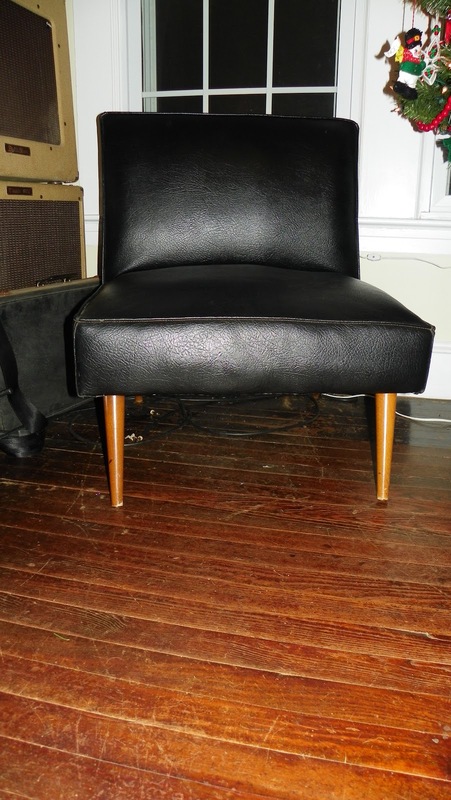 I bought a 1950's sectional off of craigslist and have been trying to muster up the courage to DIY reupholster myself. Thanks Jenna! Good luck with your sectional! Let me know how it turns out! Great after pics Misty. Just hopped over to your blog and really wish I had your talent. I have a couple chairs that I need re-done bad! You should start an etsy shop! Thanks Sarah, I love your blog design!